This multicolored salad is so packed full of vegetables that it is sure to keep the doctor away for a good long while. It was partially born out of leftovers, but I’ve made several versions of it over the past year or so using whatever vegetables I have. 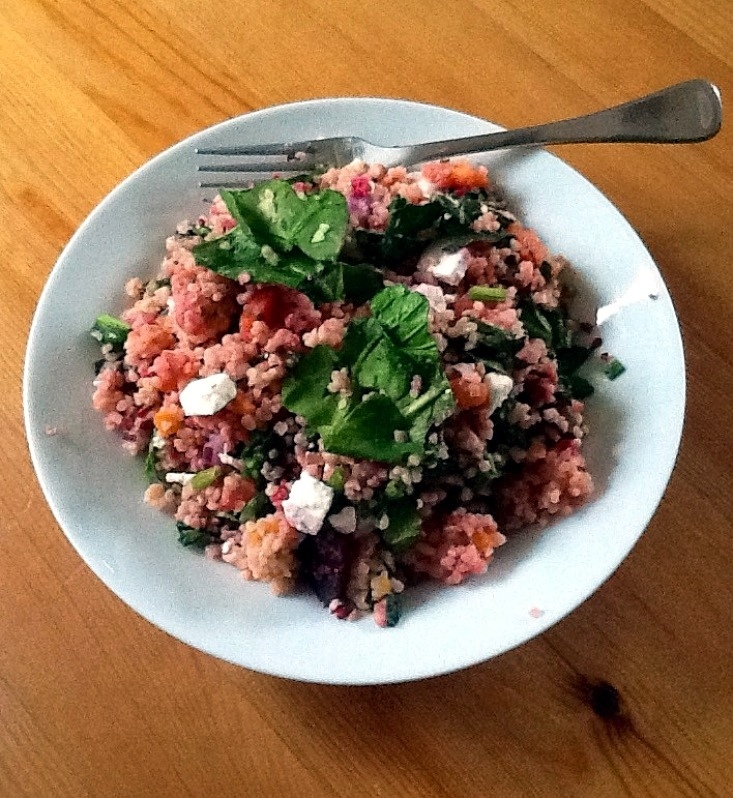 The bulgar wheat and feta are the common ground. A complex carb and a protein, both helping to keep those afternoon hunger pangs away – and boy do I suffer from the post-lunch nibbles. In this version I used beets and butternut squash leftover from my Sunday roast, a bunch of spinach, half a sweet potato, half a red onion, two tomatoes, a clove of garlic thinly sliced, a green chili, a squeeze of lemon juice, salt and white pepper. As the vegetables have so much flavor, I didn’t bother making a proper dressing and just used the lemon to give it a bit of a freshness lift. I cooked the cubed sweet potato on top of the bulgar wheat and threw everything else in raw, except the beets and butternut squash which had already been cooked although you could just as easily use ready prepared or pickled beets. I tossed it all together with the bulgar wheat straight from the stove, so the heat wilted the spinach just enough and the warm bulgar wheat absorbs all the vegetable juices as well as the flavor of whatever dressing you choose to use. 200g of bulgar wheat, all the vegetables and a package of feta made enough for four big servings and they roll in at only 240 calories per serving (as far as our calorie counting app is concerned). It’s delicious, healthy and even though it’s winter you feel like you’re having something fresh. I like to eat it at room temperature so you can taste each of the different vegetables and the cheese’s salty, creaminess is at it’s peak. It looks great, tastes great and you can almost feel yourself absorbing all the different vitamins and minerals from the multicolored veg! What could be easier for a healthy, flavor-packed lunch? What a pretty salad! I love “leftover” vegetables salads, and this combination looks very good! It’s good with roasted red peppers too! Thanks! You are so creative! Your salad looks very Weight Watcher friendly!